Includes Grove Square Cappuccino, French Vanilla, 50 Single Serve Cups (Packaging May Vary). 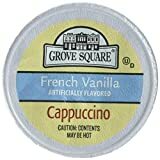 Interested in the Grove Square Cappuccino, French Vanilla, 50 Single Serve Cups (Packaging May Vary)? Is the price too high? You can easily price watch this product and we'll notify you when the price reaches your target.